Soumyajit (Patriotbaritone@aol.com) submitted this one: "I marched my first season last summer with the Patriots from Rochester, N.Y. It was an incredible summer, one I won't soon forget. 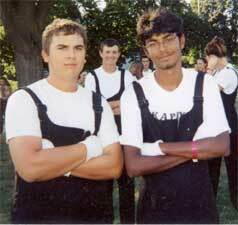 After WGI Percussion Finals in April of 2002, I met some Patriots percussion through the Southern California percussion alliance message board. They informed me of some horn spots, so I told my friend Brian, and we took off! This is us in Madison, Wis., after our last stretch of the year on finals night! From left to right, Brian and me." Thanks Sam! View the Forzato archives We're running low on Forzato pics! E-mail your submissions -- and we will get to them all, in time -- to dave@dci.org along with where and when the photo was taken. Send some biographical information about yourself as well. We'll give you full credit. Also, let us know if you want your e-mail address included, to get feedback from other drum corps fans.